John Wettaw attended the public schools in Eldorado and then graduated from Southern Illinois University Carbondale with a B.A. in chemistry in 1961. He obtained his Ph.D. in physical chemistry in 1967 from Michigan State University, working in the laboratory of Dr. Leslie Sims. He then began as a faculty member at Northern Arizona University where he continues to teach. In 1972 he was elected to the Arizona legislature where he served in both the House of Representatives (20 years) and Senate( 8 years) retiring at the end of 2000 holding the record as the longest serving Republican state legislator in Arizona history. As such he was very active in all facets of legislation, most notably his active support for all levels of education from primary through doctoral research. His service included a number of chairmanships of committees as well as Speaker Pro-Tem of the House and President Pro-Tem of the Senate. 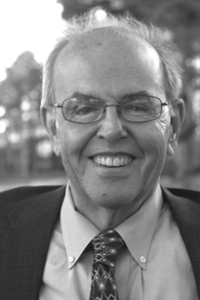 He continued to teach at NAU while serving as a legislator. He was honored with many awards including: Arizona Education Assoc. Apple Award; Arizona Students Assoc. Legislator of the Year; Legislator of the Year – Arizona Retarded Citizens Assoc. ; Mohave County Community College Distinguished Service Award; CRYSS Man of the Year; Arizona Assoc. of Chicanos for Higher Education. He also holds honorary licenses in Pharmacy, Radiological Technology and Athletic Training. Dr. Wettaw was named Science Teacher of the year at NAU in 1999, became Chair of Chemistry and Biochemistry from 2002-2004, and homecoming dedicatee in 2002. The new Biochemistry building was dedicated to him in 2001. He was awarded an honorary doctorate by NAU in 2008 for his service to education and service to the people of Arizona.